Ghislain Otis, holder of the Canada Research Chair in Legal Diversity and Indigenous Peoples is pleased to welcome Me Charlotte Chicoine-Wilson who will present the conference “ La pratique du droit autochtone ”. After graduating with a degree in social sciences and a law degree from Ottawa University, she completed a Master of Law focusing on the judicial autonomy of indigenous peoples in Columbia under the guidance of Professor Otis. In 2015, she joined the law firm Dionne Schulze based in Montreal. She focuses her work on the questions of indigenous law, environmental law and governance for clients primarily from indigenous communities and organizations. Professor Sergiu Mişcoiu will host Ghislain Otis, holder of the Canada Research Chair in Legal Diversity and Indigenous Peoples, during the international conference “Conflict Resolution and Customary Law”. This conference will take place at Babeş-Boylai University, in Cluj-Napoca, Romania March 8 and 9, 2019. It is part of the Legitimus project: “The State and Indigenous Legal Cultures: Law in Search of Legitimacy” directed by Professor Otis and financed by Social Sciences and Humanities Research Council of Canada. Other collaborators of the Legitimus project will also take part in this conference such as Professor François Féral, Dr. Laura Herta and Dr. Clément Cadinot. It will end with a cultural visit to Alba-Iulia. 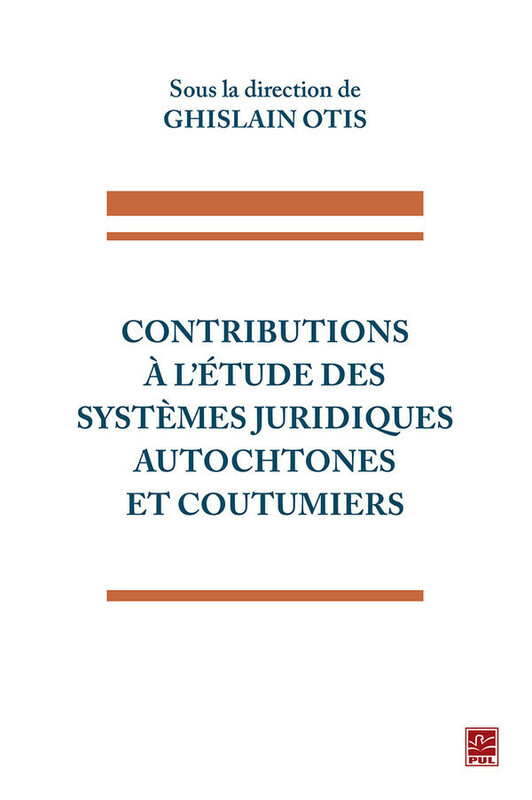 The editor Presses de l'Université de Laval has published ''Contribution à l'étude des systèmes juridiques autochtones et coutumiers'' (En: Contribution to the study of the customary and indigenous judicial systems) written under the guidance of Ghislain Otis. This collective work will tackle the quest of reconciliation through the fight for the acknowledgment of indigenous judicial traditions. Through research conducted by authors engaged directly with indigenous collaborators and partners, this book will allow readers to discover how the indigenous peoples address family law, conflict resolution and relations to territory. Please order from this link if you are buying from Canada. Please fill out this order form if you are buying from Europe. Pauline Gervier, lecturer in public law at the Université de Bordeaux, CERCCLE and member of Legitimus, will host in Bordeaux, from 7 to 9 November 2018, several members of the Legitimus group including Ghislain Otis, holder of the Canada Research Chair in Legal Diversity and Indigenous Peoples. Searchers and experts from the Legitimus project will be present during this event. Amongst the participants are Christiane Guay from the Université de Québec en Outaouais (UQO), Mylène Larivière from Makivik, Geneviève Motard from Laval University, Sylvie Poirier from Laval University, Pierrot Ross-Tremblay from Laurentienne University and Nadine Vollant from Uiuashitun and the director of the Legitimus project, Ghislain Otis, from the University of Ottawa. The Forum was put in place to share results of research directed during the partnership between the Canada Research Chair in Legal Diversity and Indigenous Peoples and the Atikamekw Nation Council. The goal of this collaboration was to reinforce the Atikmekw nation's governance on matters of domestic violence and child protection. To document the Atikamekw's knowledge and traditions, 118 interviews were conducted with participants and interveners of the three Atikamekw communities and the surrounding urban areas. These interviews are an essential key for searchers to understand and determine legal basis of the Atikamekw law. Thus, the objective of this gathering is to share results and understandings on the matter and to situate the contribution of this research amongst the entirety of the research conducted on the judicial Atikamekw traditions in different areas of interest of the nation (family, child welfare, justice, territory).